←Get Your iRunFar TNF Puffy Jacket! An emblematic fall day–with bright sunshine yet cool air and a light breeze–greeted runners at the 2017 The North Face Endurance Challenge 50 Mile Championships in the San Francisco Bay Area of California. 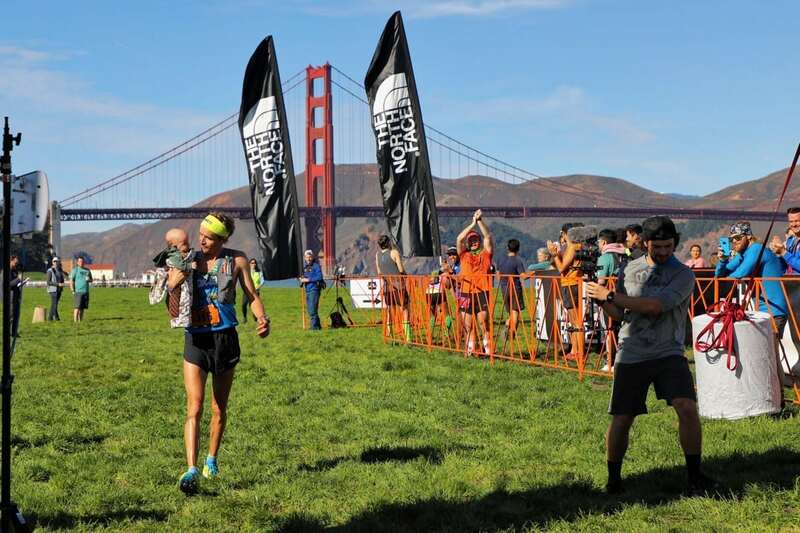 For this year, the course was reformatted, and though it contained many of the same trails and aid stations throughout the southern Marin Headlands, a new starting line in Marin City and a new finish line at Crissy Field in San Francisco over the Golden Gate Bridge meant an overall new feel. 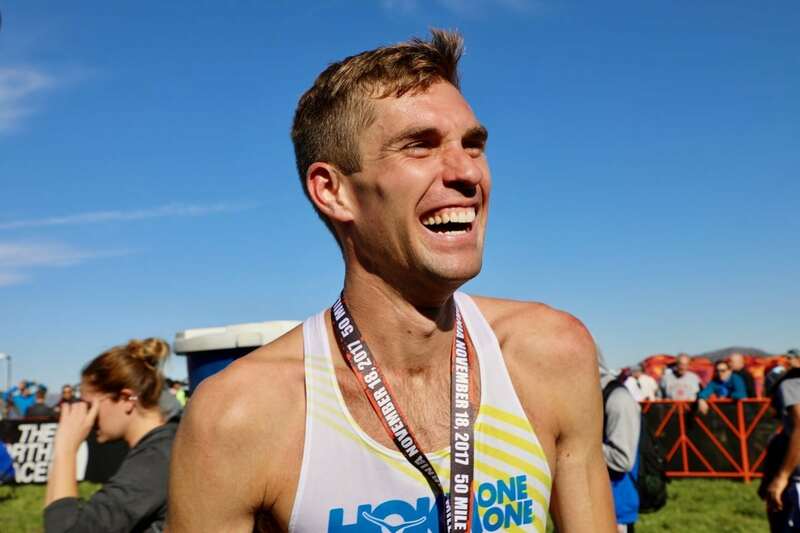 After sharing the lead with other men in the race’s first half, Tim Freriks (pre-race and post-race interviews) used the second half to break free from the rest of the competition and run unimpeded to a big win. While it may have been another woman who set the early pace in the women’s race, Ida Nilsson (pre-race and post-race interviews) marked her with no issue before assuming the lead in the race’s second half. Though her challengers were just a minute or a few back at times, Ida was stronger than them all and emerged as champion for a second year in a row. As usual, we’ll be updating this article with additional results as well as links to race-related articles, photo galleries, and race reports. Be sure to check back. 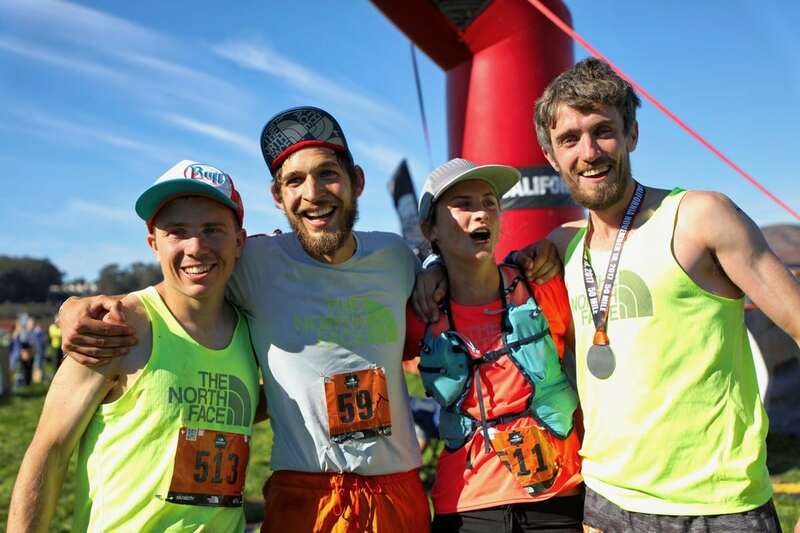 A special thanks to The North Face for making our coverage of this race possible! Thanks, too, to Jaybird and GU Energy Labs for supporting our coverage of TNF 50. To get all the latest trail and ultra news from iRunFar.com, subscribe via RSS or email. Thanks for following our week-plus of TNF 50 coverage! If you enjoyed our work, please consider making a donation to support us. With your help, we’re looking forward to a great 2018. Thank you! 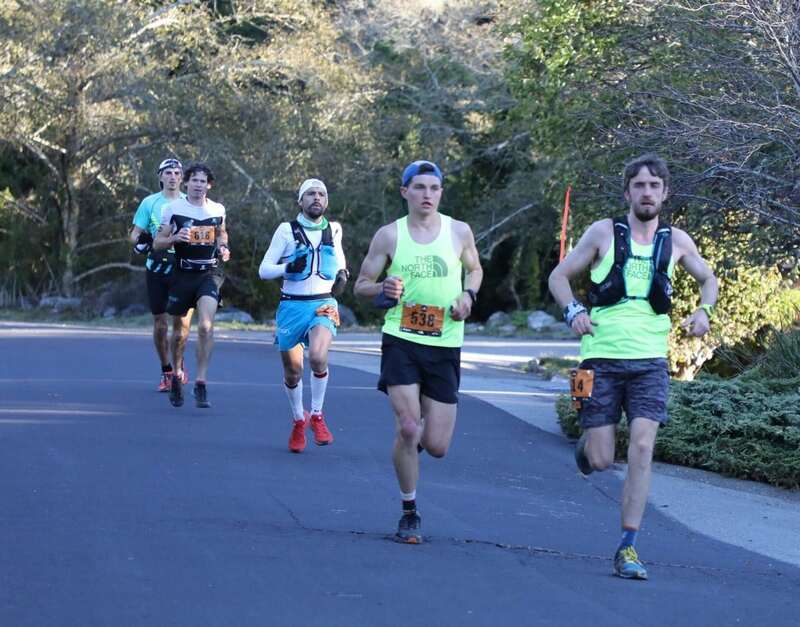 When the race fired off from its 5 a.m. start in Marin City and we all peered up the paved, immediately steep road, Zach Miller (pre-race and post-race interviews) led everyone out at a pace others would later describe as cross-country race pace. True Zach form. By the top of that first climb at 2.5 miles in, Zach had settled back into the lead group. From there until Stinson Beach, mile 28–and though there were other interlopers who came and went from in, around, and even in front of the group at times–a lead trio of Tim Freriks (pre-race and post-race interviews), Zach, and Hayden Hawks (pre-race and post-race interviews) ran within earshot and eyesight of each other. After the race, Hayden said that while Zach descended the fastest, he and Tim climbed a bit better than Zach, and, thus, their accordion played on. 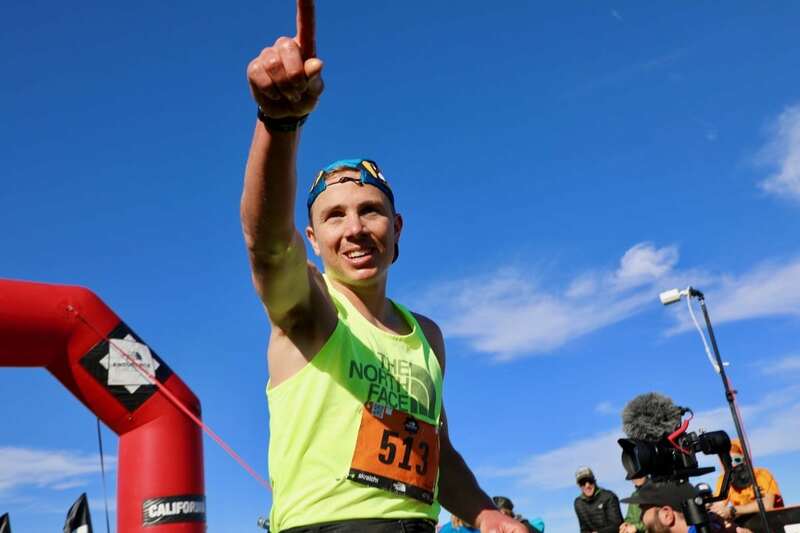 For more than the race’s first half, Matt Daniels, a fast runner at shorter distances on the track, road, and trail debuting at 50 miles, ran in the front half of the men’s top 10, eventually settling into fourth place by mile 18. Incredibly, a tight pack holding the rest of the men’s top 10 ran together for almost 30 miles. At mile 27, fifth through 10th–Paddy O’Leary (pre-race interview), Blake Hose, Tòfol Castanyer, Max King (pre-race interview), and Tyler Sigl–ran right together and just five minutes off the lead. At the finish, Paddy remarked about this phenomenon, saying that he didn’t run alone once until mile 40. After mile 27, Tim put his foot on the gas and accelerated on the stout climb up the Dipsea Trail from Stinson Beach. When we next saw Tim at Muir Beach 2, mile 39, Tim had a little over five minutes on Zach, running that section almost 30 seconds per mile faster than him–and he looked calm and smooth in doing so. In the next nine miles, he added another eight-plus minutes to his lead. When we saw him on the Golden Gate Bridge two miles from the finish, he was just under 14 minutes ahead. Call it a glory lap from there with no pressure from behind, Tim crossed the Crissy Field finish line as 2017 champion. In the race’s final miles, Zach and Hayden ran a few minutes apart from each other, both running well with no challenges from behind, but suffering through their own kinds of pain. Zach said he caught a glimpse of Hayden a few minutes back when they were on the Golden Gate Bridge and it caused him to close as hard as he could. The pair, who went one-two last year, went two-three this year, separated by about five minutes when all was said and done. Kris Brown, who’s he? Turns out, a pretty fast SoCal runner who just broke out onto the national scene with his fourth-place come-from-behind race strategy. Kris didn’t appear in the men’s top 10 until mile 39, where he was ninth. The guy hammered, though, moving up to sixth by mile 42, and then fourth by mile 48, a position he held until the finish. On Thursday in his pre-race interview with us, Paddy correctly predicted his fifth-place finish. In short, he remembered back to having finished 13th at this race two years ago and ninth last year, saying that means he should finish fifth this year and win next year. Ahem, you better start training, Irishman. The back half of the men’s top 10 was full of interesting and unique men. All-mountain-sportsman Nick Elson, a Canadian, proved he has leg speed, too, in taking sixth. Aussie Blake, who was well into the international trail-ultra scene a couple years ago before taking a break, returned to take seventh. Eighth was do-everything-man Max. Ninth was Spaniard Tòfol, and 10th was Tyler. Early pace pusher Matt Daniels would DNF. Mountain-running phenom Tayte Pollmann finished his first 50 miler, though things ended a bit rough after a fast start with the leaders. Well, she said she’d probably take the pace out hot. 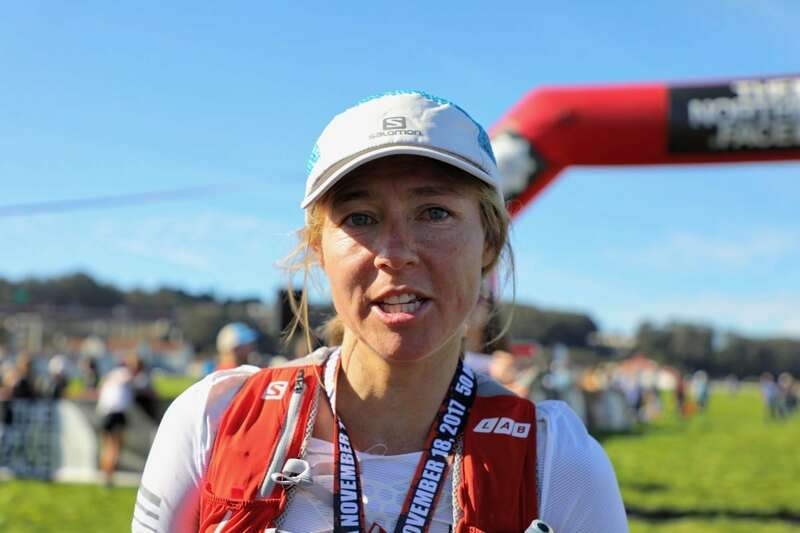 Ahead of the race, pro road runner Renee Metivier (pre-race interview) said that, though it would be a good idea to start slow in not only her first 50 miler but also her first ultramarathon, she’d probably still go out fast. Indeed, she did. 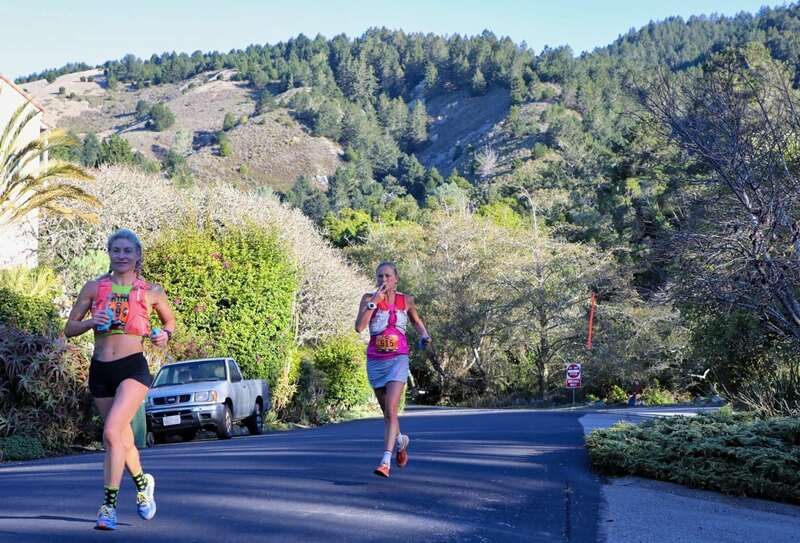 The first four times we saw the women, from mile 2.5 through mile 27 at Stinson Beach, Renee was pacesetting and Ida Nilsson (pre-race and post-race interviews) marked her. After the race, Ida explained that Renee started really fast but that she likes going fast, too, so she keyed off Renee’s pace for quite a long distance. Turns out, that long distance was past the race’s halfway point. Through mile 27, they were still almost shoulder to shoulder. After that, Ida said she felt strong on the climb from Stinson Beach and that she really likes the wooded section in the headlands above there, so she moved well. Out of the forest and back down to Muir Beach at mile 39, Ida led with Renee nowhere in sight. There, Ida would be faced with a new pressure, though, that of Clare Gallagher (post-race interview) just one-and-a-half minutes off the lead. Clare, who’d been running in the third to fifth-ish positions for the first half of the race, was making herself known in running for the win now. But Ida was the stronger woman on the day because a couple miles later, when they passed through Tennessee Valley for the second time at mile 42, she’d increased her lead to just under four minutes. From there, the pair ran almost the same speed to the finish line, where Ida would cross as champion for the second year in a row, and where Clare would take second, improving upon her fifth last year. Third-place Megan Kimmel (pre-race and post-race interviews) said after the race that, at 10 or 12 miles in, she wasn’t sure if she would finish. 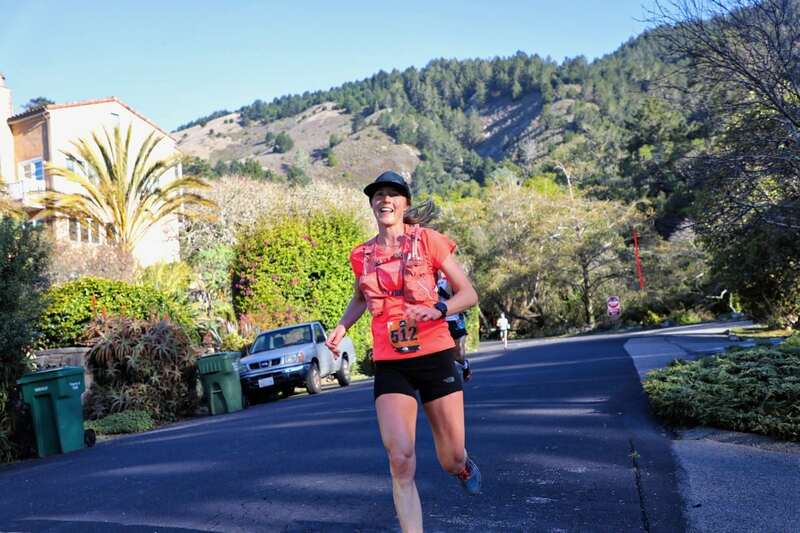 Her calf muscles have long been her TNF 50 nemesis, and she said she was feeling them early. 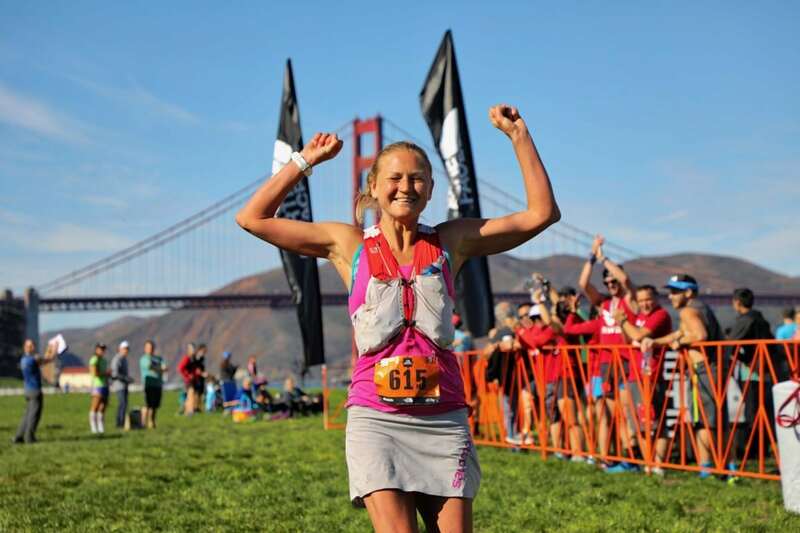 Turns out, her calf muscles hung in there just fine and so did her strategy–what she described after the race as her budding “ultra strategy”–of starting easier so that she could run strong later. I did think it was a little unusual where, in the first half of the race, Megan was running several minutes and positions back from the lead, but it all made sense when, starting a mile 39, Megan had moved up into third place, a position she’d maintain to the finish. Local runner Megan Roche had a helluva’ debut at the 50-mile distance with her fourth-place finish. Early on, she seemed patient and calm, hovering at or just outside the top five. Later in the race, she moved up to fourth place and looked incredibly focused upon keeping that spot. A breakout runner on the day was Brittany Peterson, who also ran strong inside the women’s top 10 for most of the day to finish fifth. In the balance of the women’s top 10, Renee held on after her super-fast start to finish her first ultra in sixth place, Abby Mitchell ran steady all day for seventh, Stephanie Violett (pre-race interview) finished smiling in eighth, Kelly Wolf ran well in another long ultra for ninth, and Amy Leedham moved up into the women’s top 10 late for the 10th position. Frenchwoman Anne-Lise Rousset ran quite close to the lead in the first 20 miles before slowing some to finish 11th. Anne-Marie Madden (pre-race interview) DNFed after telling us as early as mile 18 that today wasn’t her day. 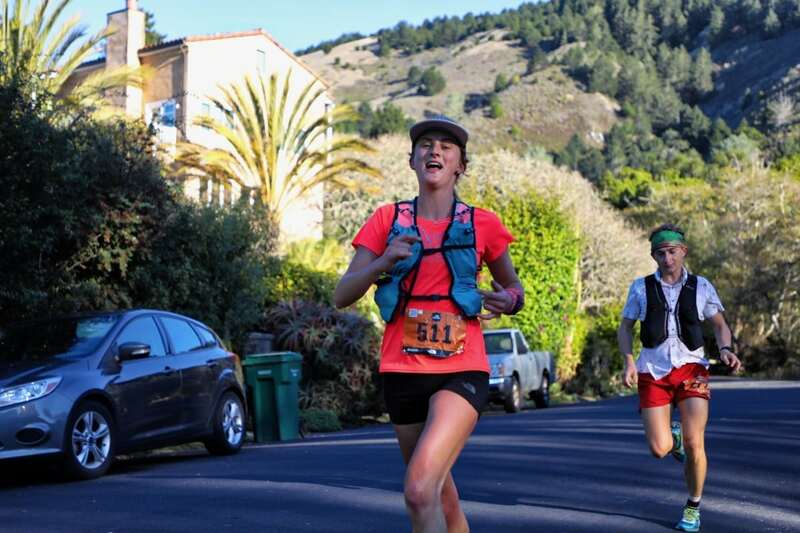 Fourth place last year, Annie Jean, DNFed at mile 18, and Anna Mae Flynn dropped at mile 42.
iRunFar is always so welcomed by the Marin County trail running community. First, thank you to Brett Rivers of the San Francisco Running Company for hosting our pre-race interviews, and thank you to Dylan Bowman and Hillary Allen, our pre-race interview co-hosts. Thank you to our race-day office guru, Marissa Harris, who wrangled our field team with perfection. Thank you to all of our field volunteers, Francois Grenier, Soon-Chul Choi, Casey Szesze, Burr Purnell, Bradley Fenner, Alice Sergent, Blair Lockhart, Gilbert Lemieux, Charles Hornbacker, and Adam Gothelf. What happened to Mario Mendoza? Thanks for the awesome coverage. Great stuff, iRF! Thanks for another day of world class coverage! Tim Freriks! Rocking everyone’s boat wherever he races, what a runner. What shoes did Frerick’s wear? Thanks for providing the coverage. The results seem to show that the women’s field is getting more competitive, with the gap between 1st and 10th in the women’s race less than in the men’s race. Is this the first that has happened in a top-tier ultra?